The wedding I get to share with y'all today happened in the fall of 2016, and it is everything! The color palette was made for fall. There were so many unique, stunning details. And the couple was just the sweetest! We are so looking forward to our crazy busy fall wedding season, and we also love looking back on some of our past fave fall weddings. This is certainly one of our all time favorites! I can't wait for you to see all the gorgeous photos by B.Matthews Creative! Holly and Caleb were married on September 17, 2016 at The Barn at Twin Oaks Ranch. Their color palette was gorgeous - marsala and ivory with hints of blush and gold. Holly said she wanted an "elegant wine" theme, which is definitely a theme we can get behind! "I wanted a fall wedding just for these colors!" Holly said. "I couldn't have been happier. It was stunning!" Holly's bridal gown came from David's Bridal, and ohhhh, my goodness! It had an illusion neckline, beautiful lace, and a classic A-line silhouette. It was classic and gorgeous! This lady was such a pretty bride! Holly's bridesmaids wore rich wine-colored, floor length gowns from Lulu's. Glamorous, stunning and perfect for fall! We always LOVE infinity dresses and how they allow each bridesmaid to choose a silhouette that she feels confident in! The groom and his guys wore classic black suits with burgundy ties. This bridal party looked fabulous! Barn flowers are the best flowers, and this wedding was no different! The bouquets consisted of ivory roses, deep red dahlias, and a little bit of greenery. They were elegant and unique! Holly's bouquet was cascading, while the bridesmaids' bouquets were more tailored and rounded. "They looked beautiful together and especially with the dresses," Holly said. "I loved all of the florals! Even the boutonnieres were all different, but still cohesive and just amazing!" Holly was lucky enough to have not one, but TWO first looks on her wedding day! She had a sweet, emotional first look with her dad, and then she and Caleb spent a few intimate moments together before their ceremony! This groom was soooo sweet! If you needed another reason to love this wedding... There were BABIES! Cute, tiny little babies! Let's talk about Holly and Caleb's gorgeous, romantic, unique ceremony details. Two of Holly's favorite details from the day were her aisle and altar! Their altar was simply elegant, with greenery, a few florals, and hanging lanterns. It was absolutely dreamy! Their aisle was lined with scriptures from 1 Corinthians 13 painted on pieces of wood, as well as wire sconces filled with florals. In keeping with the wine theme, they had their guests sign wine corks instead of a traditional guestbook. For their unity ceremony, they placed a bottle of wine and letters to each other inside a locked box, which is something they will treasure forever! Have we mentioned that wine-themed weddings are the best?! Holly and Caleb's ceremony was super sweet - the perfect celebration of their love and the beginning of their lives as husband and wife! They had the cutest ring bearers around, who carried the most adorable (and appropriate!) wooden signs. Holly, Caleb and their loved ones were absolutely beaming as they said their I do's... It was such a sweet, unforgettable ceremony! As you all know, our team LIVES for details. We love coming up with unique, show-stopping details for every single wedding, and one that really stood out at this wedding was a hanging drink display! We hung a black painted pallet with rope, added some florals, greenery and hanging wire vases, and used it to display their signature drink, The Real McCoy. Such a fabulous detail! In fact, Holly said it was her favorite detail of the day! "So unique and again just beautiful!" she said. Holly and Caleb's reception was elegant, romantic and stunning! They had chocolate tablecloths with ivory and marsala runners on their tables, as well as florals in mercury glass vases, lanterns, candles, and simple place settings. They had a head table, which had large lanterns filled with candles in front of it - cozy and dreamy! TheCakePlace did an amazing job on the cakes at this wedding! Nothing beats a simple white cake with cascading flowers (sitting on top of a wine barrel, of course! ), a glittery custom cake topper, or that delicious chocolate groom's cake! Holly and Caleb even kept the wine theme going with their favors! "Our favors were wine colored personalized koozies with the phrase 'cheers to many years!'" Holly said. 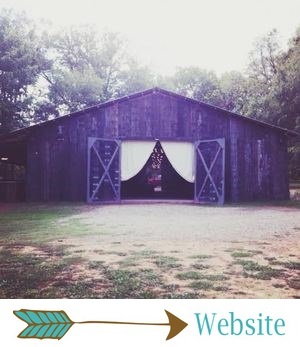 Barn weddings are always as fun as they are beautiful, and this one was no exception! There were SO many good dance moves at this wedding, judging by the photos. ;) Holly and Caleb had such a fun night with their loved ones, celebrating the beginning of their lives as newlyweds! After Holly and Caleb made their grand exit, they left for an amazing honeymoon! "We went to Cancun, Mexico and stayed at an all-inclusive resort," Holly said. "We wanted to go where neither of us had gone before. We had a blast and loved it!"